*Originally published on the Movie City USA blog on August 22, 2007. Sylvester Stallone will be difficult to explain to our kids and grandkids. I don’t mean that in the sense that he’s a Napoleonic, steroidal, barely talented musclehead who has attained a mystifyingly high level of movie stardom – that phenomenon has been around since the silent era and continues to this day (see: Rock, The). I mean it in the sense that from 1976 through the early 1980’s, Sylvester Stallone was viewed in popular quarters as a powerful young cinematic voice. That will be difficult to explain to the wee ones in the same way that the words “Oscar-winning actor Roberto Benigni” or “starring Dane Cook” are sure to baffle future generations. Stallone wrote the screenplay to Rocky, and in legendary fashion, rejected lucrative studio offers to produce it without him in the lead role. Of course, he got the part, the film was a huge success, and Stallone was Oscar-nominated not only for the script but also for Best Actor. That led to a slew of late 1970’s/early 1980’s writer/director/star efforts, but also to something much more sinister – on almost every film he appeared in between Rocky and Cliffhanger, he got a screenplay or co-screenplay credit. That’s 17 onscreen credits (and he’s writing/directing Rambo IV, don’t you know), and many other Stallone films are assumed to have uncredited rewrites by their star. But this is one of the fascinating paradoxes of Stallone – he is cinema’s great quasi-intellectual, an assault of intimidation, willpower, ten-cent words, and assumed sexuality. He rode that early critical validation for decades, and always possessed enough clout to insist on his own rewrites, despite any noticeable artistic or (eventually) financial returns. Another of Stallone’s great paradoxes is that his entire persona was built off of the Rocky character – a rough-around-the-edges, down-on-his-luck, violent-but-charming thug who perseveres against impossible odds through the force of his character to prove himself and regain his self-respect. Not only was this plot repeated verbatim in Rocky’s I-VI, but it was also the theme of Rambo’s I-III, Cliffhanger, Over the Top, Nighthawks, Copland, Paradise Alley, Daylight, and…oh, let’s just say every movie Stallone ever made. The paradox here is that Stallone was believable in this role up to and including the first Rocky – after that, Stallone was no longer the struggling actor but rather Stallone the international superstar, and re-hashing the archetype became increasingly ridiculous and obnoxious. He wasn’t the common man anymore, and was frequently repulsive in his attempt to play the charming roughneck. But along with Schwarzenegger, Gibson, and few others, Stallone was a new breed of international movie star, and as such he was able to bully projects to his liking, usually mangling them into his own false image. This brings us to Bob Clark’s 1984 film Rhinestone, starring Stallone and Dolly Parton. It was “co-written” by Phil Alden Robinson, although he was apparently aghast at the drastic changes Stallone made to his script. Clark and Robinson are two of the more mercurial talents in Hollywood – they have credits both great and terrible, as well as sporadic periods of unemployment. Whatever else Clark and Robinson are, they’re not stupid, and yet Rhinestone is a stupid, stupid movie, with most of the blame falling directly on Stallone. The premise is flimsy but workable – a struggling country singer (Dolly Parton, in a succession of skin-tight, plunged-neckline gowns) in New York tries to get out of her contract to a lecherous club owner (Ron Leibman, making it work somehow) by betting that she can turn a schlub taxi driver (Stallone) into a successful singing cowboy. It’s a lame set-up, but no more fabricated than your average 1930’s, let’s-put-on-a-show musical. In fact, a reinvented brand of that genre had come into vogue in the 1980’s with the success of Fame and Flashdance, and the greenlight for Rhinestone was no doubt a product of that popularity. The big problem with Rhinestone is that it should be a Dolly Parton vehicle also featuring Stallone, but after the first 10 minutes, it becomes a Stallone vehicle also featuring Dolly. Several times throughout the film, Dolly pulls out an acoustic guitar and starts to sing, and they’re the best moments of the film. Yet she never gets more than 20 seconds into any song before Stallone wanders into the room and interrupts her, as though he can’t stand to see her take even a little bit of his spotlight away. Stallone mugs mercilessly throughout the film, which we are supposed to find funny and adorable. After a half hour of Asian stereotypes, New Yawker stereotypes, and Italian stereotypes, Parton drags Stallone back to her Tennessee farm to tutor him in the ways of hillbilly stereotypes. Does this lead to a series of overcoming-the-odds montages? Ooh, I’ll never give it away! However, I will say this – Stallone wears a succession of funny hats, practices a series of funny walks, and sings A LOT of Eagles-lite country songs, including one particularly unmemorable number entitled “Drinkenstein”. The Tennessee sequences are miserable, and we keep waiting for the action to return to New York, where at least Leibman’s sleazy club owner has a neon fire in his living room. An actor like Travolta could have pulled this movie off (and at that time, Travolta’s career was bleak enough that he would have accepted a second-banana part to Parton), but Stallone is hapless both as a comedian and as a singer, even when we’re intended to believe that he has attained a measure of competence. Romance blooms between Dolly and Stallone, which is both baffling and pretty depressing – we get the impression that Parton is barely concealing her real-life repulsion. 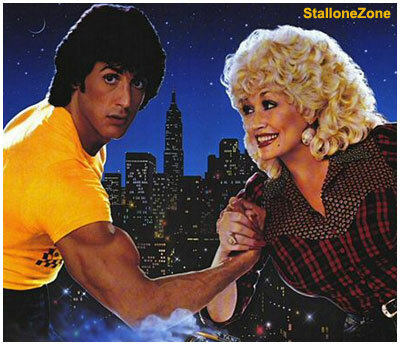 Eventually, Stallone and Parton wow the locals in Tennessee, pledge undying love to each other, and head back to New York for their inevitable triumph…when suddenly, for no reason whatsoever, Dolly is forced to pull off a plot device that is insanely contrived, even compared to what we’ve already seen. Hours before Stallone is set to perform in front of a hostile audience, without any provocation at all, Dolly humiliates Stallone in front of dozens of his friends and his entire family. She calls him a robot, a “mudpie”, a polluter, and an amateur, then threatens to go sleep with the lecherous club owner. Not only is this sudden assault nonsensical, but it’s completely out of character – up to this point, Dolly’s wise but sassy Jake had been incredibly supportive of Stallone’s monstrous Nick (not to mention that her entire future rested on him successfully performing in front of a hostile crowd). Did someone decide that the movie needed be fifteen minutes longer? At any rate, fifteen minutes is all this scene adds to Rhinestone. Of course, they break up and make up, and finally return to the stage, where Stallone wins over a crowd surreptitiously stacked with hecklers (because he’s so good!) and performs three…count ‘em, three songs in a row, ending with the expected triumphant 1980’s freeze frame. On the Cinematic Narcissism Scale, this sequence falls just above Kevin Spacey in K-Pax and just below Kevin Spacey in Beyond the Sea. Bless her heart, Dolly does what she can with the role, but an overabundance of both bad dialogue (“You’re thinking of shacking up with the guru of doo-doo?” is a standout) and preening male co-stars keep getting in the way. Parton has only 5 real film credits to her name, and I feel like we got cheated out of this one. She manages to sneak in a couple of good lines, the best being “Freddie, there are two kinds of people in this world, and you ain’t one of them.” I don’t intend to argue that a properly cast Rhinestone would have made a great movie, but with Stallone in charge, it’s not even passable. Truly one for the ages! The original piece that I published on MCUSA was over 1950 words long, but I managed to trim it down to a breezy 1300 or so here. I think I dared you to watch this! I am so proud!